Hey, I just want to let you know that this post is in partnership with Sprouts Farmers Market. I received monetary compensation for my time, and, as always, all opinions shared are my own. 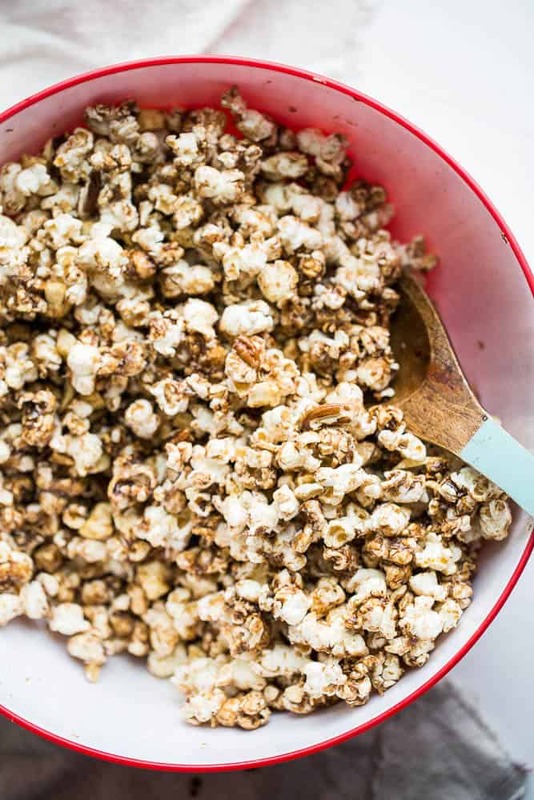 Yes, another chai recipe for you — in the form of chai caramel popcorn. And it won’t be the last chai recipe I throw at you before Christmas. If you don’t have a jar of Homemade Chai Spice go make some. I’ll wait. I should have set a goal to use as many forms of coconut as possible, because I almost used all of them. The caramel sauce is coconut oil, coconut sugar, and coconut cream. 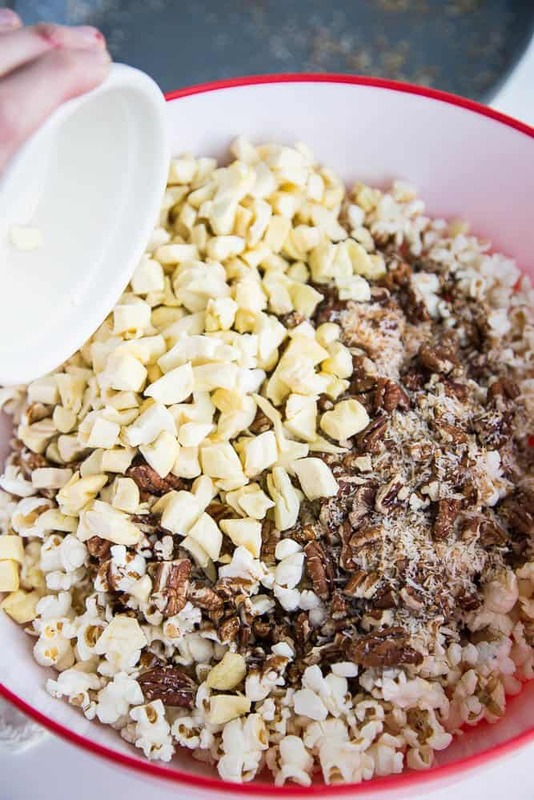 And there’s shredded coconut that gets toasted with the pecans and tossed in the popcorn at the end. Yum, right? 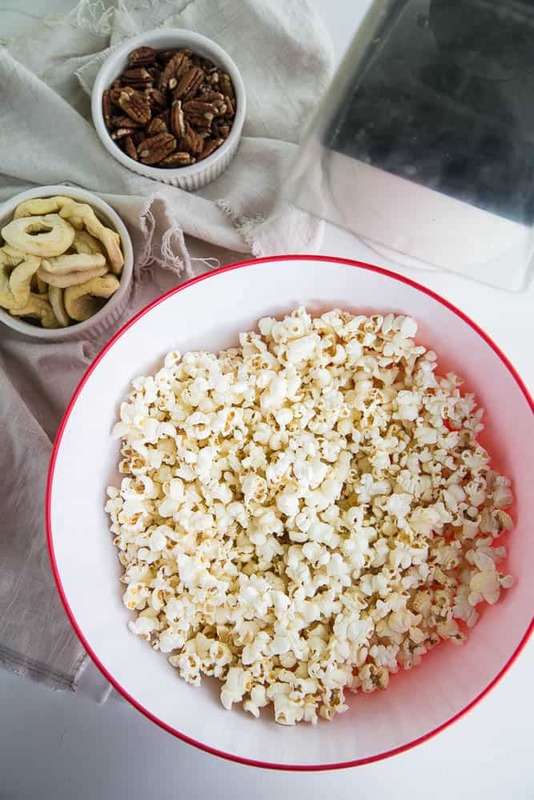 No, popcorn isn’t paleo, but it’s one of our favorite family treats and we make some a couple times a month. I found organic, GMO-free popcorn at Sprouts in the bulk bins (I LOVE BULK BINS!!) along with pecans and unsweetened dried apple rings. Do you know how hard it is to find unsweetened dried fruit? By the way, Sprouts is having a Incredible Bulk Sale this week — 25% off all of their “scoopable” bulk bin items! (Not the pre-packaged bulk items.) I found some fantastic 70% Ecuadorian fair trade dark chocolate that I’m going to stock up on. You can’t have too many bags of dark chocolate chunks for Christmas treat-making. Do you have an air popper? I grew up with air-popped popcorn, so having one of these was an absolutely necessity when we got married, despite my aversion to single-task appliances. Yes, air poppers are nice, but you can use whatever method you want to pop your kernels. The chai spice in this caramel sauce gives it a Christmas Eve vibe and reminds me of those cinnamon dough ornaments — have you ever made or received those? They smell… well, like Christmas. Like cinnamon and baking spices. Honestly, since I’ve started using my chai spice blend, I have a hard time using cinnamon alone. Or pumpkin pie spice. IT’S JUST NOT ENOUGH ANYMORE. 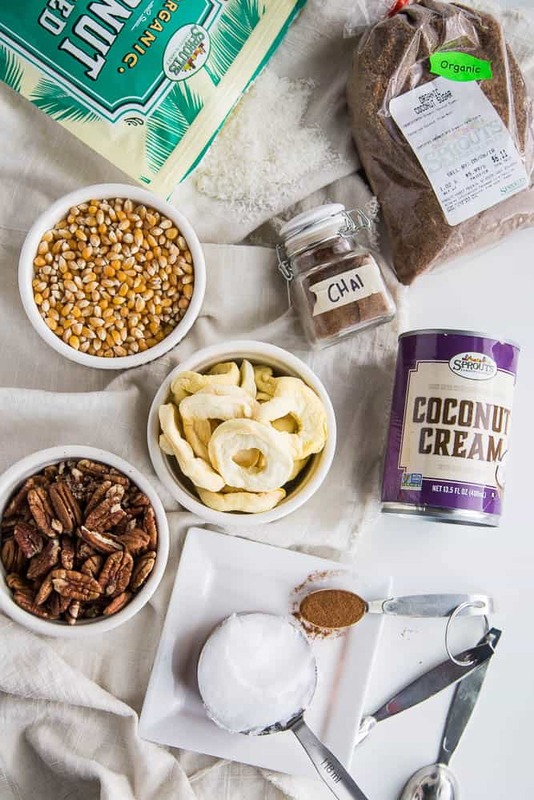 Toasting the coconut and pecans for a couple minutes is totally optional, but one of my mottos in life is to always toast coconut, given the choice. Usually I opt for the chunky coconut flakes over the finer, shredded coconut, but I felt like they got a little soggy covered in caramel and most of them sank to the bottom of the bowl during the first test run. The shredded coconut sticks to the popcorn better. 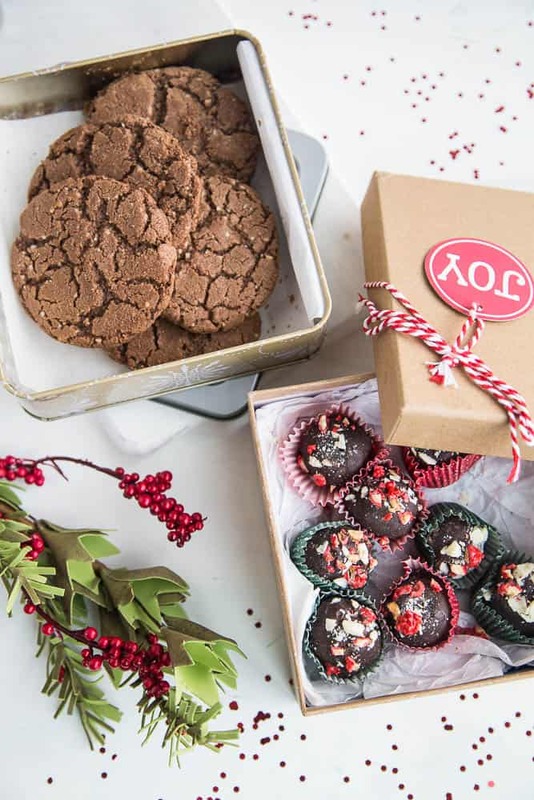 This makes such a great little treat to give to neighbors and friends around the holidays! 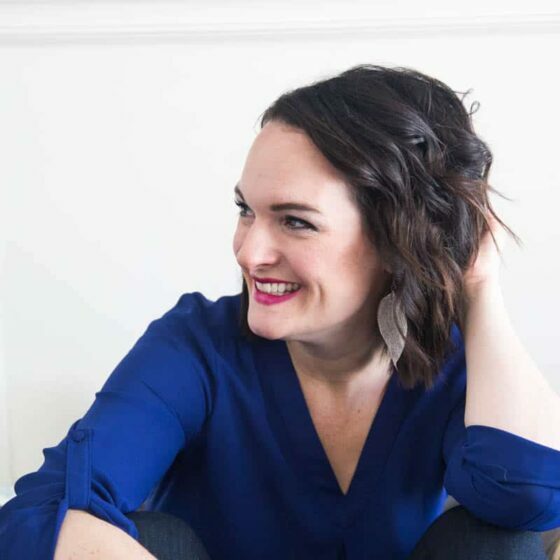 Through Sprouts, I was paired up with two other bloggers for a fun little treat exchange! We each came up with a gluten-free treat using bulk bin items and sent them to each other. I got these Gluten-Free Nutty Chocolate Crunch Cookies from Holly at A Baker’s House and Gluten-Free Chocolate Oat Peanut Butter Balls from Kaylee at Lemons and Basil. 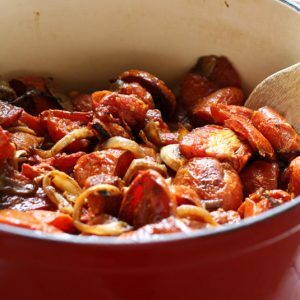 Click over and find the recipes for both on their sites! And head over to Sprouts and grab some bulk bin goodies this week before the sale ends! 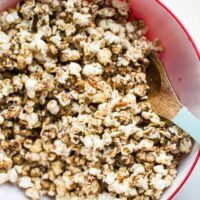 Chai Spice gives this Chai Caramel Popcorn an interesting twist! 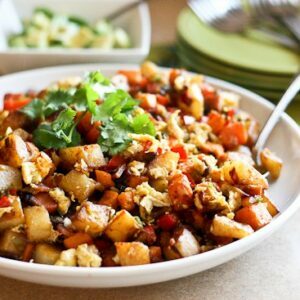 PLUS you'll love the shredded coconut, chopped pecans, and chewy bits of dried apple. Pop the popcorn in an air popper according to the manufacturer's instructions into a very large bowl. Melt the coconut oil in a medium saucepan over medium-low heat. Stir in the sugar, and cook until the oil starts to bubble a little around the edges. 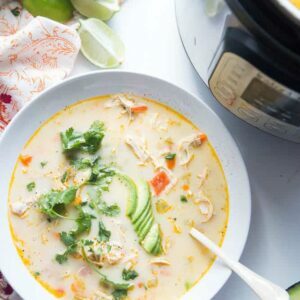 Add the coconut cream (it will sizzle a lot) and whisk quickly until the entire mixture becomes smooth and no longer grainy. Stir in the chai spice, cinnamon, and sea salt. Set the caramel sauce aside. In medium skillet over medium heat, add the pecans and the coconut. Toss it around frequently until the coconut is golden brown and the nuts are toasted. Remove from heat. 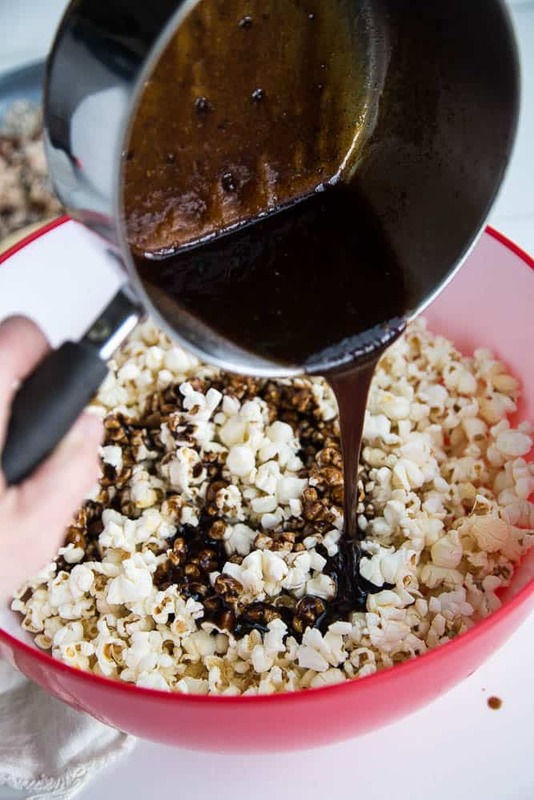 Drizzle the caramel sauce over the popcorn in a thin stream. Add the coconut, pecans, and chopped apple rings. Stir well until the caramel sauce is spread around the popcorn. Insert face into bowl. Eat. Caramel popcorn is my FAV….and with chai? UHH WANT. My fave, too! Especially the sticky gooey kind. mmmm. 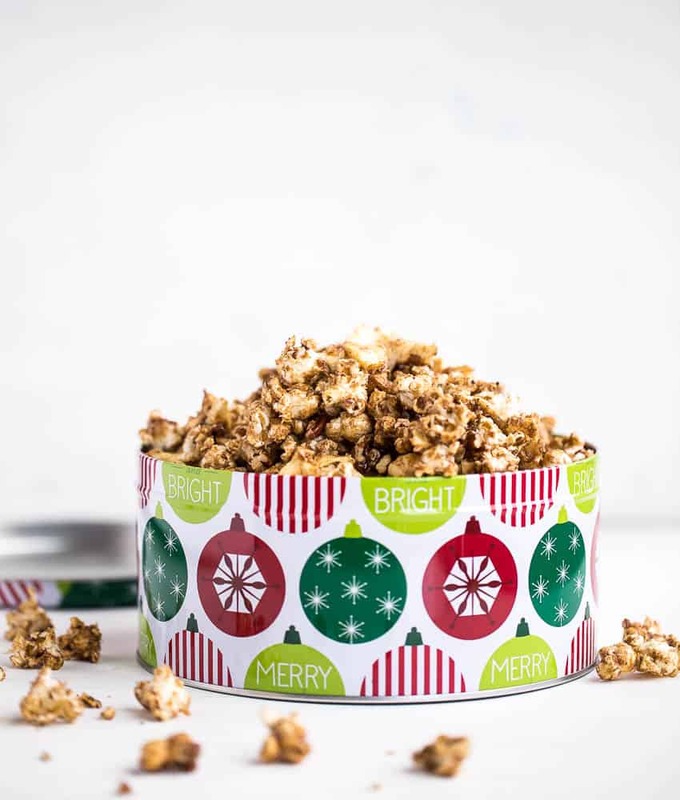 You had me at chai caramel popcorn! Love everything about this! Oh so good! Thanks again for sending me your goodies. I have an extreme fondness for caramel popcorn that goes way back to summers on the Ocean City, NJ boardwalk (my parents still send me containers of Johnson’s Popcorn now and then), and your popcorn took me right back to those good food memories. You’re so welcome, Holly! I love that it brought back memories for you! Aaaagh this popcorn looks sooo tasty! I love all the added goodies! 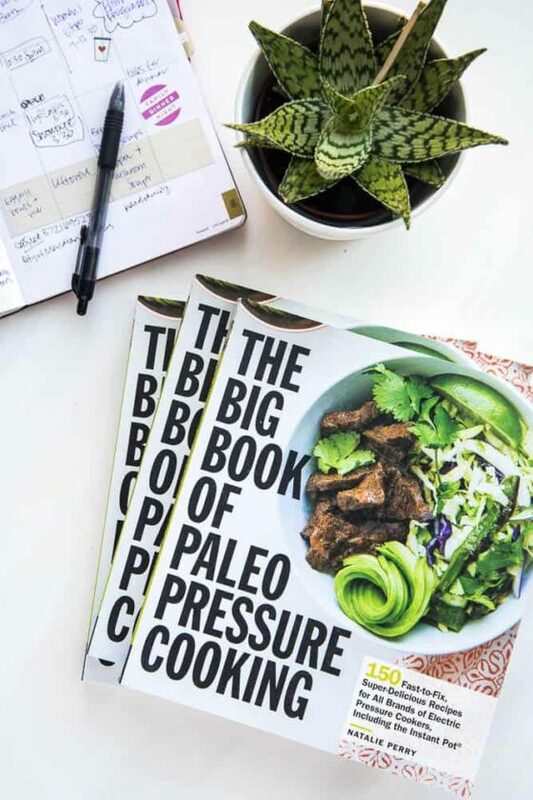 I could see this being such an awesome treat for a gift exchange. Love it! Yes, agreed! It’s definitely my new favorite. I love these flavors so much! Yum!